Mr. Alcaraz is considered the most prolific Chicano artist in the nation. He has worked diligently for over twenty years chronicling the political ascendancy of Latinos in America and vigorously pushed the boundaries of Chicano art in the post Chicano art era. His cartoons are pictures that are truly worth one thousand words - words that have provoked and inspired millions of conversations, arguments, and dialogic discussions regarding the state of Latino affairs all over the country. He is the creator of the first nationally syndicated, politically-themed Latino daily comic strip, “La Cucaracha,” which is seen in scores of newspapers including the Los Angeles Times (syndicated by Universal Press Syndicate, home of “Doonesbury” and “The Boondocks”). Lalo has produced editorial cartoons for the L.A. Weekly since 1992 and also creates editorial cartoons in English and Spanish for Universal. His work has appeared in the New York Times, the Village Voice, the L.A. Times, Variety, Hispanic Magazine, Latina Magazine, Mexico’s La Jornada, Germany’s BUNTE and many other publications. Alcaraz and his work have been featured on CNN, the CBS Evening News, ABC, NBC, Univision, Telemundo, PBS, Al-Jazeera TV, NPR, Air America Radio and on Spain’s Radio Nacional de España. Mi Ciudad magazine named him “Best Latino Cartoonist in Los Angeles.” He has been featured by Rolling Stone magazine, Los Angeles magazine, Associated Press, Editor & Publisher, and profiled extensively in the Comics Journal. 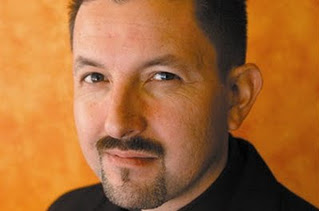 Lalo Alcaraz is currently a faculty member at Otis College of Art & Design in Los Angeles. As an author, his books include Migra Mouse: Political Cartoons on Immigration (2004). Alcaraz also authored the first collection of his daily comic strips La Cucaracha (2004, Andrews-McMeel Publishing). He illustrated Latino USA: A Cartoon History (2000 by Basic Books) with author Ilan Stavans - this book currently is being updated for its historic 15th anniversary paperback edition. Alcaraz is the co-host of KPFK Radio’s wildly popular and satirical talk show The Pocho Hour of Power heard Fridays at 4 p.m. in L.A. on 90.7 FM. He co-founded the seminal Chicano humor ‘zine, POCHO magazine, and also co-founded the political satire comedy group Chicano Secret Service. 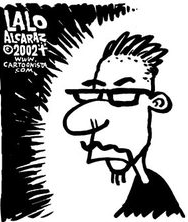 Lalo Alcaraz has received five Southern California Journalism Awards from the Los Angeles Press Club (most recently this year) for Best Cartoon in Weekly Papers, and numerous other awards and honors including “The Latino Spirit Award” from the California Legislature and the office of the Lt. Governor, honors from the Los Angeles City Council, the California Chicano News Media Association, the UC Berkeley Chicano Latino Alumni Association, the United Farm Workers of America, the Los Angeles County Federation of Labor, the Center for the Study of Political Graphics, and The Rockefeller Foundation, among others. Alcaraz is a 1987 graduate of San Diego State University where he received his bachelor’s degree “With Distinction” in Art and Environmental Design. In 1991, he earned his master’s degree in architecture from the University of California, Berkeley. Alcaraz was born in San Diego and grew up on the border. He is married to a hard-working public school teacher and they have three extremely artistic children. Building on his success as an artist and writer, Lalo’s next project is a re-boot of the famed Pocho.com, his pioneering humor, satire and cerveza webzine/blog/news site. 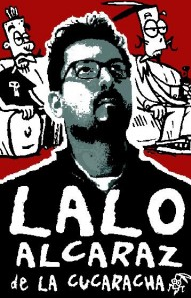 A pioneer in new media Twitter, Lalo at @laloalcaraz has over 20,000 tweets and has a worldwide following. AC: What was the very first drawing you ever did? Who recognized your potential? How did your parents feel about your art and what did you want to be when you grew up? LA: I drew an angel for the school Christmas program, in kindergarten (That’s my first published drawing, so to me that counts as the first). Artistic ability runs in the family - got it from my mom’s side. My grandfather was an illiterate farmer and ranchero who could draw architectural plans, then build things. I suppose I always wanted to be an artist - only thing I was good at! AC: As you progressed in school, what kinds of things did you draw? What inspired you? At what point did you develop a socio-political awareness? LA: I drew in class, and then in college I majored in art and was the obnoxious political art student. Imagine an art student with attitude - unheard of! I was hanging with Chicano artists in San Diego, David Avalos and Victor Ochoa, political artist and a muralist; they taught me that making art political was okay and righteous. LA: politicized Mexican-American - ”POCHO” means Pissed Off Chicano Outcast. AC: What was your high school experience like? What inspired you to go to college and pursue a post graduate degree? LA: I didn’t enjoy high school but my art teacher, Mrs. Nichols, always showed me that there were art schools out there. She would give me catalogues for prestigious private art schools like Otis-Parsons . . . and now I teach at Otis. I went to college to get a career that would lead to employment and to simultaneously change the world. How did I end up with a Master’s in Architecture from Berkeley? AC: At what point did politics and art converge? Are you an artist or political activist? LA: I turned political cartoons into protest art in the early 90’s during the racist Prop. 187 era. AC: Who were some of the artists that you’ve admired? Who do you admire now? LA: I dig many political cartoonists - worship the late Paul Conrad. I hear my work reminds people of cartoonist Ron Cobb, also sometimes Conrad, on a very good day! AC: You do a cartoon almost every week. Where does the inspiration come from? Don’t you run out of ideas and if you do, where do you get the material? LA: I do nine toons a week. My inspiration comes from the anger I feel at injustice, hate and discrimination. I got a chip on my shoulder, damn right. Never run out of ideas – not yet anyway. AC: When did you realize that your political cartoons could cause talk and inspire dialog? LA: When people would thank me for explaining an issue or giving them the ammo, or just the words, to explain an issue to someone else. And also the countless teachers who use my comics in college and high school classes to bring up current events and issues. AC: Would you consider yourself an instigator, educator, or innovator? LA: I don’t know. Maybe a little of all three. AC: Has a newspaper ever dropped your strip because they didn’t agree with your politics? How would you feel about that? LA: Censorship of the marketplace. I think that’s the way to describe it. AC: What has been your relationship with the LA Times? LA: AWESOME! I love them, except for the time they dropped me for 36 hours and the public (and also Times columnists) came to my rescue. Google the Associated Press story about it, March of 2007. AC: You and your work have been featured on all the major networks and around the world on various media platforms. What is your greatest victory so far? Greatest disappointment? LA: Bringing down the Soviet Union - just kidding. I have been generously covered and I am happy about that. I could always use a little more TV exposure! LA: I am the funniest Latino on Twitter, and I am the funniest cartoonist on Twitter, but I am the second funniest Latino cartoonist on Twitter. AC: Tell us about your teaching position at Otis College of Art & Design. LA: I Teach editorial illustration and it’s quite a change from teaching continuation HS kids cartooning. I can throw any probe at the college kids. They have mad art skills! I love it! AC: I am told your wife is a teacher and you have three really talented kids. Are you teaching them how to illustrate? LA: Genetics have taught them. AC: When people look back on your work, what do you want them to feel? LA: ANGER that makes them want to change the world! AC: Where can people check out your work?